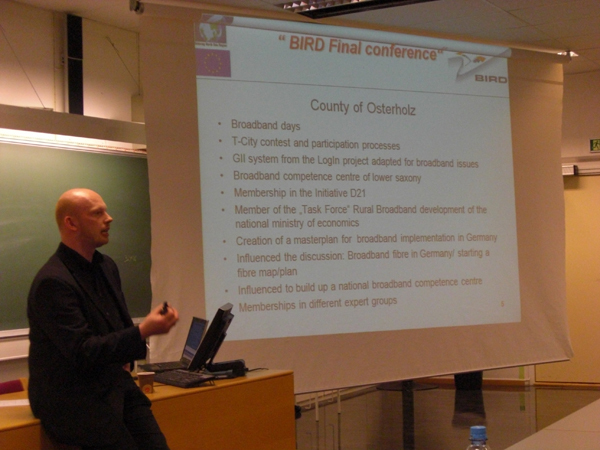 The main aim of the BIRD project was to exchange experience and expertise on broadband implementation to enhance regional (rural) broadband access and usage. Based on the regional findings and evaluations as well as the meetings of the think tank, BIRD has worked out several recommendations for Broadband development and use on North Sea Region, regional and local level, recommendations for broadband as a tool for regional development and has given recommendations for the new spatial agenda of the Programme. Implementing those recommendations and analyses is a process which was started with BIRD and which is still ongoing on regional as well as international level. As a final result seven regional broadband development concepts have been carried out during the project. Additionally 25 best practices and eight case studies were worked out by the partners on the basis of a common methodology. For instance the best practise in Värmland, Sweden has succeeded in increasing knowledge of e-commerce and stimulating as well as promoting e-commerce development in the region. The region invested in a portal ‘Meetingpoint Wermland’, in short, this is a digital toolbox filled with services for sending and receiving electronic invoices, where companies and municipalities can operate e-commerce. Another example was the initiative E-courses for Teacher Training in Groningen, The Netherlands. This best practise was about learning & teaching by use of broadband technology and provide recommendations for instance about how to increase IT-skills of teachers and students. The project involved a wide range of sectors, such as the private sector: users and businesses and the creative industry, the public sector: municipalities, regional and national authorities and governments, and education and research, such as research institutes and universities. Moreover, the project established strong links with other projects including the Baltic Rural Broadband project and other Interreg IIIB project: ICT for SME's, LoG-IN and E-Voice. Thereby, the project could exchange complementing experiences and benefit form each other outcomes. The project BIRD has achieved sound results in setting the strategic points for the future development of broadband accessibility in rural areas. The project succeeded in raising the awareness of stakeholders of all policy levels in relation to this topic by addressing it in the right moment. 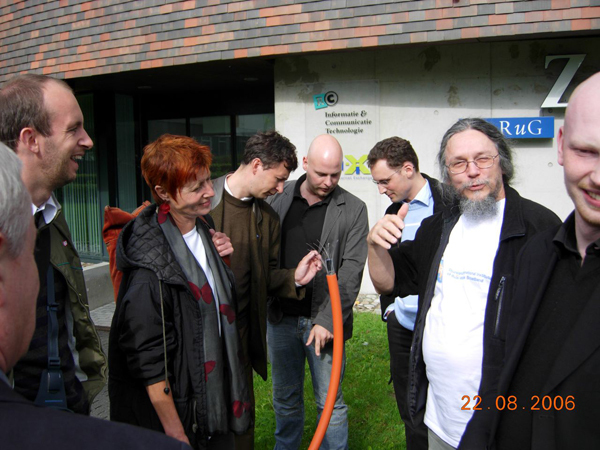 As one example the Lead Partner was able to forward the idea of a task force on area-wide Broadband access to the federal government and Ministry of Economics in Germany. 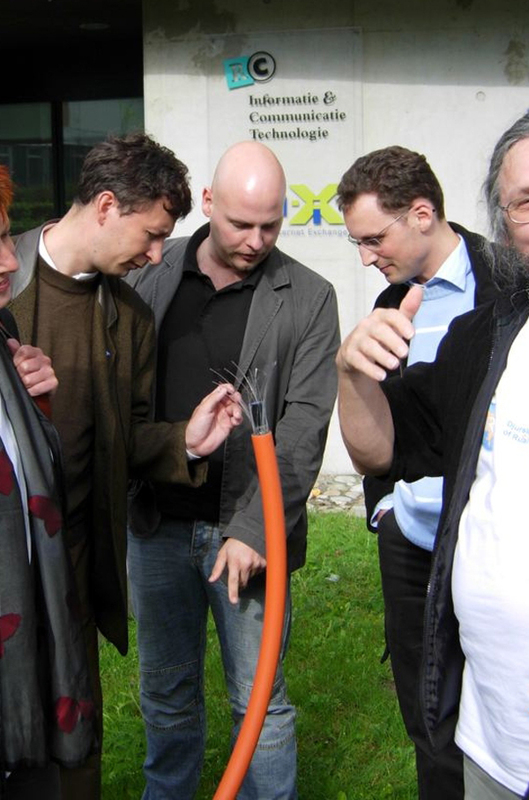 Further lobbying influenced the National Ministry of Economics to initiate a broadband competence centre for Germany. The Lead Partner region has achieved to become a competence centre in the rural-broadband sector. By implement the BIRD office, the project succeeded to set the institutional surrounding enabling a long lasting impact of the project by promoting innovation to business and education through broadband. As a consequence of BIRD, the IVB project e-clic has been developed and approved.